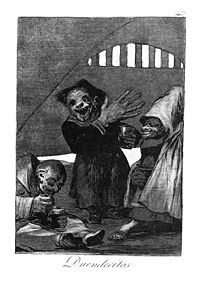 "Little Goblins" from the Los Caprichos set of aquatint prints created by Francisco Goya in 1799. A goblin is a mythical creature of Germanic and British folklore, often believed to be the evil, or merely mischievous, opposite of the more benevolent faeries and spirits of lore. Like many such creatures, there is no single version of a goblin; the term is more generic for those small creatures that live in dark places and cause trouble, but in more recent years, the term has become more concentrated on green-creatures that live in caves and terrorize children. Despite local variations, goblins have almost universally been described as troublemakers. They are either simply tricksters and mischievous, like immature children, or malevolent, evil-doers dangerous to human beings. Like many similar creatures, they have the characteristics of spirits rather than beings existing in the physical world. Thus, they share similarities with ghosts and and also with demons as associated with some Christian teachings and lore. Traditional cultures throughout the world also have stories and beliefs about figures that share similarities with the European goblins. In Zimbabwe, one cause of a child being born with a disability is that a goblin called a "zvikwambo" may have impregnated the mother while she was sleeping. The mountain goblins of Japan, the tengu, which are in the form of either an old man who has a long nose and walks barefoot or a crow tengu having the wings, beak, and claws of a bird but the body of a man. In early tengu legends, they did such evil deeds as starting fires and kidnapping and eating children. They could also transform themselves into humans and mislead people. In later tengu, legends they become more mischievous and even helpful to people. One tengu leader was said to have been a master of the martial arts who taught a legendary founder of the martial arts. According to some traditions, goblin comes from Gob or Ghob, the king of the gnomes, whose inferiors were called Ghob-lings. However, the name is probably derived from the Anglo-French gobelin (medieval Latin gobelinus), which is probably a diminutive of Gobel, a name related to the word kobold. Goblin is also related to the French lutin. A group of goblins is referred to as a "horde." Female goblins are referred to as "hags" or "crones." Goblins are grotesque fairies that can range from dwarf height to human height. Various (sometimes conflicting) abilities and attributes have been given to them. Some accounts claim they are mostly invisible to the human eye, and thus act as phantoms. However, even in traditions where they are invisible, it is still widely known (although how remains mysterious) what they look like underneath their invisibility. They are usually believed to be shorter than human beings; depending upon the source, they can either be stout or thin; their brow is fully covered with thick hair and their mouth is filled with yellowed, crooked teeth. Goblins are often depicted as possessing a coarse, raspy sounding, and slightly high-pitched voice, speaking human languages along with their own, and possessing a cunning intellect. In recent depictions, goblins have been portrayed as green in color, but this is only a modern tradition. Many characteristics have been attributed to the generic term of goblin. In some cultures, they are more tricksters, who steal horses to ride at night, hide small objects, tip over pails of milk, and alter signposts, much like the pixies of Great Britain. Some believe that goblins are more malevolent, weaving nightmares out of gossamer and inserting them into the ear of a sleeping human, stealing human women and children and hiding them away underground, or even stealing human babies and replacing them with ugly goblin babies (changelings). A goblin smile is said to curdle blood and a laugh to sour milk and cause fruit to fall from trees. Goblins are often believed to be nomadic, never staying too long in one place. There is no consensus on the origin of goblin myths. Since goblins are similar to faeries and other spirits of Europe, it is possible that they share a similar origin. Many scholars believe that such creatures came out of an interest in Paganism and its mysticism, especially the belief in nature spirits and magic. Goblins could possibly come from the belief that, along with virtuous pagans, there were evil ones that became evil spirits. Sir Walter Scott, in his Letters on Demonology and Witchcraft, ascribed gnomes, kobolds, and goblins, along with Scottish bogles to all correspond with a caricature of the Sami people. While from a folkloric perspective their origin may not be known, there were mythological tales that recount it: One of the most popular origin stories for Goblins states that they originated in France, in a cleft of the Pyrenees, but left at some point in history, spreading throughout all of Europe. A Red Cap, or Redcap, also known as a powrie or dunter, is a type of malevolent murderous goblin, elf, or fairy found in British folklore. They are said to inhabit ruined castles along the border between England and Scotland, to murder travelers who stray into their homes, and to dye their hats with their victims' blood (from which they get their name). Indeed, redcaps must kill regularly, for if the blood staining their hats dries out, they die. Redcaps are very fast in spite of the heavy iron pikes they wield and the iron-shod boots they wear. Outrunning the buck-toothed little demons is quite impossible; the only way to escape one is to quote a passage from the Bible. They lose a tooth on hearing it, which they leave behind. The most infamous redcap of all was Robin Redcap. 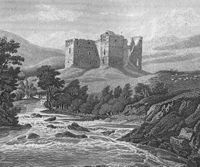 As the demonic familiar (assistant) of Lord William de Soulis, Robin wreaked much harm and ruin in the lands of his master's dwelling, Hermitage Castle in Liddesdale, Scotland, close to the English border. Men were murdered, women cruelly abused, and dark arts were practiced. So much infamy and blasphemy was said to have been committed at Hermitage Castle that the great stone keep (the castle) was thought to be sinking under a great weight of sin, as though the very ground wanted to hide it from the sight of God. Yet Soulis, for all the evil he wrought, met a very horrible end: He was taken to the Nine Stane Rigg, a circle of stones hard by the castle (a nearby megalithic circle), and there he was boiled to death in a great cauldron. A Kallikantzaros (Καλλικάντζαρος) pl. Kallikantzaroi, is a malevolent goblin in Greek and Cypriot folk tradition. They dwell underground but come to the surface from December 25 to January 6, (from the winter solstice for a fortnight during which time the sun ceases its seasonal movement). Its name is possibly derived from "kalos-kentauros," or "beautiful centaur." It is believed that Kallikantzaroi stay underground sawing the "World Tree" that holds up the earth, so that it will collapse, along with earth. However, when they are about to saw the final part, Christmas dawns and they are able to come to surface. They forget the Tree and come to bring trouble to mortals. Finally, on the Epiphany (January 6), the sun starts moving again, and they must go underground again to continue their sawing. They see that during their absence the World Tree has healed itself, so they must start working all over again. This happens every year. The Kallikantzaroi are creatures of the night. There were ways people could protect themselves during the days when the Kallikantzaroi were loose. They could leave a colander on their doorstep: If a Kallikantzaros approached for his evildoings, he would instead decide to sit and count the holes until the sun rose and he was forced to hide. The Kallikantzaroi also could not count above two, since three is a holy number, and by pronouncing it, they would kill themselves. Another method of protection is to leave the fire burning in the fireplace all night so that they cannot enter through there. In Greek Kallikantzaros is also used for every short, ugly, and usually mischievous being. If not used for the above-mentioned creatures, it seems to express the collective sense for the Irish word leprechaun and the English words gnome and goblin. Kobold is the German word for goblin, and the German version is very similar to the Redcaps of Britain. They are said to haunt mines and underground places, are mischievous, and play tricks. Sometimes they are bound to one particular household to haunt, while other times they are allowed to roam freely. Due to the generic implications of their name, goblins have been used in numerous different types of literature for many years. Some of the earliest fairy tales, including The Goblin and the Huckster by Hans Christian Andersen (1853), The Benevolent Goblin by Gesta Romanorum, and The Goblin of Adachigahara (Japanese) are just a few tales depicting goblins, as well as numerous stories of the Brothers Grimm. Victorian poet Christina Rossetti in her poem, "Goblin Market," used goblins as symbols of earthly desires who tantalize and nearly destroy a girl who falls under their spell. Author George MacDonald, in The Princess and the Goblin, portrayed goblins as malevolent, subterranean creatures. The book is said to have been a childhood favorite of J.R.R. Tolkien, who populated his Middle-earth with goblins, which appear to be related to his orcs. Other more recent books that feature goblins are: The Book of Wonder (1912) (The Hoard of the Gibbelins) by Edward Plunkett (18th Baron Dunsany), The Brownies and the Goblins (1915), Outside Over There by Maurice Sendak, Rainbow Goblins, The White Goblin, and The Revenge of the Shadow King, by Derek Benz and J.S. Lewis. Numerous role-playing fantasy games incorporate goblins, following the traditions of the inherently evil and malicious, with varying coloring, and generally matted and filthy hair. This type of goblin appears in Dungeons & Dragons. The distinctive green-skinned, hairless, capricious, and generally amoral (rather than absolutely evil) goblins created for Warhammer are direct progenitors of goblins in more modern games, such as those in the Warcraft Universe or Magic: The Gathering. In film, goblins are sometimes given a different representation. In the Jim Henson film Labyrinth, Goblins figure prominently. Jareth the Goblin King, a powerful sorcerer, commands a legion of foul, diminutive, largely incompetent creatures. In other animated fairy tales and more child-oriented programs, goblins once again become more mischievous than evil, although they are often still depicted as frightening. ↑ Furyu, Tengu: The Legendary Mountain Goblins of Japan. Retrieved September 20, 2007. ↑ The Oxford English Dictionary (Oxford Press, 1971, ISBN 019861117X). ↑ Micha F Lindemans, Goblins (1997). Retrieved July 2, 2007. ↑ K. M. Briggs, The Fairies in English Tradition and Literature (London: University of Chicago Press, 1967). ↑ James Logan Mack, The Border Line (Oliver & Boyd, 1926). ↑ Carlo Ginzburg, Ecstasies: Deciphering the Witches Sabbath (Chicago: University of Chicago, 1991, ISBN 0226296938). ↑ Soula Mitakidou, Anthony L. Manna, and Melpomeni Kanatsouli, Folktales from Greece: A Treasury of Delights (ISBN 1-56308-908-4). Briggs, Katharine. "Redcap." An Encyclopedia of Fairies, Hobgoblins, Brownies, Boogies, and Other Supernatural Creatures. ISBN 0-394-73467-X. Dubois, Pierre. 2005. The Complete Encyclopedia of Elves, Goblins, and Other Little Creatures. Abbeville Press. ISBN 0789208784. Froud, Brian. 2003. The Goblin Companion. ISBN 186205648X. Froud, Brian. 2004. Goblins! Harry N. Abrams. ISBN 0810949415. Page, Michael, and Robert Ingpen. 1998. Encyclopedia of Things That Never Were. Studio. ISBN 0140100083. Sikes, Wirt. 2003. British Goblins: Welsh Folk-lore, Fairy Mythology, Legends and Traditions. Kessinger Publishing. ISBN-10 0766179931. This page was last modified on 17 December 2013, at 17:55.